Eating seasonally used to be an every day fact of life. You (well, most people anyway) grew a large part of what you ate, or you bought locally grown, fresh produce. Meaning that the season determined what ingredients were going into every day dishes and what was being served up for meals. With the dawn of chain grocery stores, industrial farming, and better transportation- that’s not the norm anymore. Which in some ways is great, because we can enjoy our favorites throughout the year, although usually at a higher cost depending on where it grows best in the world and when. What we’ve made up for in convenience though, I’ve noticed has had a serious impact on flavor. Take my beloved tomatoes for example. Yes, I can go to any grocery store and get some bright, beautiful, phot worthy fruit any time I want, but even ‘in season’ they’re often mealy, and lacking any real vibrant flavor. Not the tomatoes of my youth, plucked fresh from my Grandma’s garden! With that in mind, the Hubs & I were eager and excited to plant our garden this Spring. On the short list, we had tomatoes, herbs, a variety or pepper plants, and several types of squash & zucchini. Dun Dun Dun. <enter> The big bad ‘Squash Bug’. This thing is nothing to contend with. It’s wide-spread, and allllllll over the South. This bug doesn’t care about where you came from. It just wants to eat your plants. It wants to bore a hole into the vine of your plant; from there it eats the root with relish. It doesn’t care what your gardening dreams are, or your hard-earned money, time, sweat, tears that have been lovingly sowed into each row. The Squash Bug does what the Squash Bug wants. It’s a real bully that way. Sadly, there’s been a squash bug invasion this year in Central Virginia, and it’s decimated the local population this Summer- my own plants included. I didn’t even know this pest was a thing, y’all! At least not until one after another (this little sucker was on a mission and systematically attacked my plants, in order) my squash plants kept withering and dying. Fine one evening when I watered, dead as dirt the next day. I was ready to pull my hair out I was so frustrated. I mean I know I’m not the best at growing things other than humans, but y’all- I was trying! And everything else was growing like a weed. Needless to say, I now know there’s such a thing, and why they’re the bane of back yard squash growers the whole state over. Hey, at least it wasn’t me though, lol. 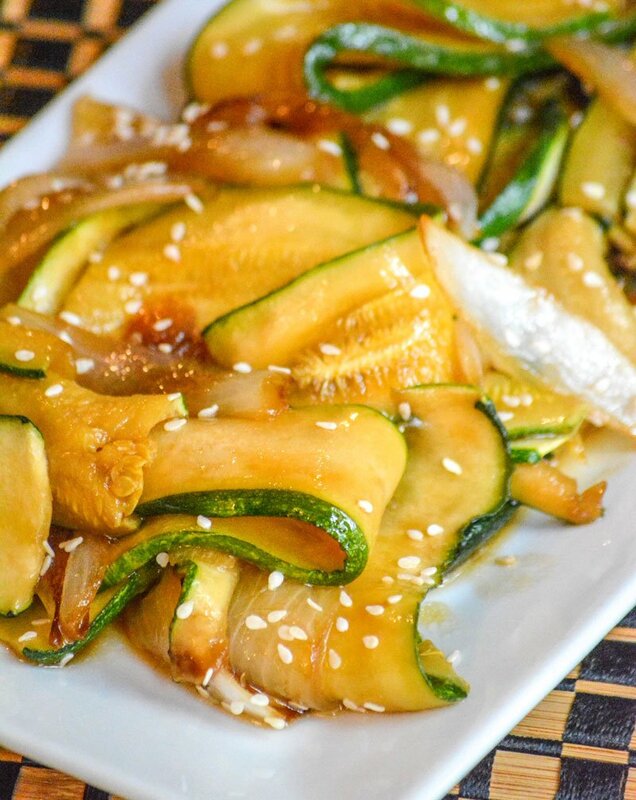 So sadly, the zucchini in this delicious Japanese Steakhouse Hibachi Style Zucchini & Onions comes from a local grocer. While it’s not ‘garden fresh’, it tasted like it! The veggies are one of my favorite parts of the whole Hibachi meal and experience. I kid you not. 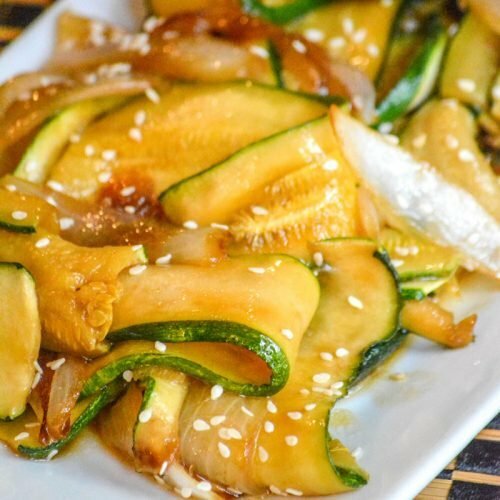 Hibachi doesn’t actually reflect or apply to the flavor or the vegetables in this recipe. It loosely translates to ‘fire pot’, and instead refers to the style of cooking- which has been embraces and perfected by hibachi-style restaurants in the U.S. since about 20 years after WWII. Like any other restaurant, each individual store may have their own spin on hibachi-style veggies. Some may even include a different blend of vegetables, but this reflects the combinations we love here from our local joints. 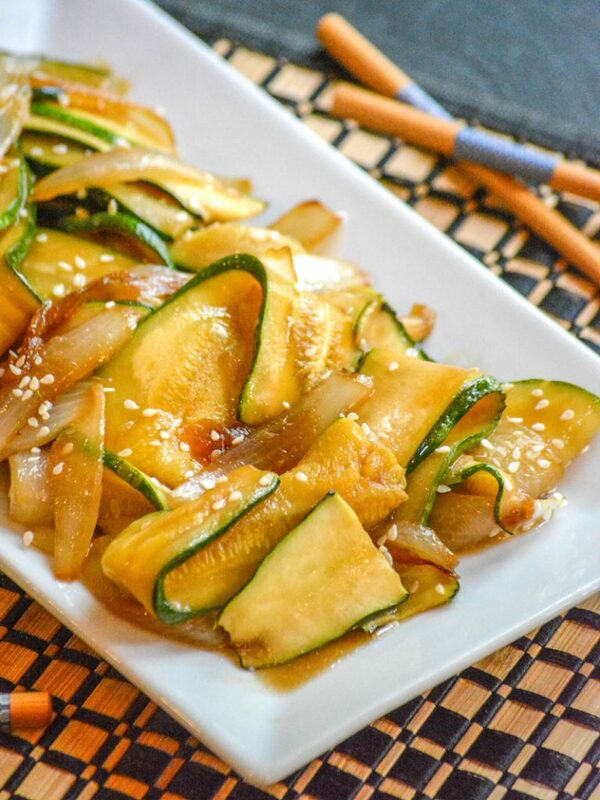 Tender zucchini squash and crisp white onions are sauteed in a savory Asian-style sauce in this Japanese Steakhouse Hibachi Style Zucchini & Onions recipe. It’s guaranteed to be a new favorite Summer side dish. Luckily, a quick trip to the grocery store will let you enjoy it year-round- even if the Squash Bug comes callin’. 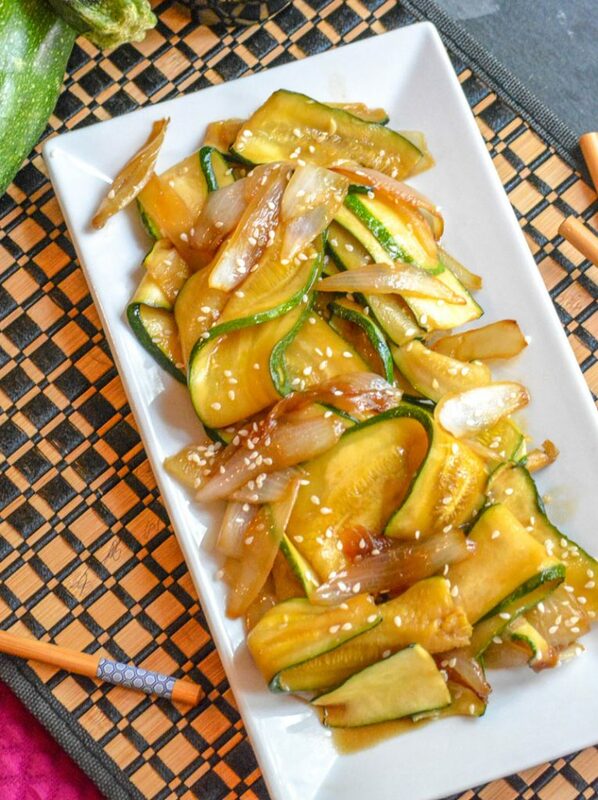 Other Zucchini Ideas You Might Also Enjoy: Cheesy Zucchini Rice, Baked Gnocchi with Zucchini & Tomatoes, Zucchini Fritters with Chili Lime Mayo, & Zucchini And Squash Au Gratin. Add the oil to a large skillet, or wok, and heat over medium. When the oil's nice and hot, add in the onions, breaking them apart and stirring while they cook- for about 5 minutes. 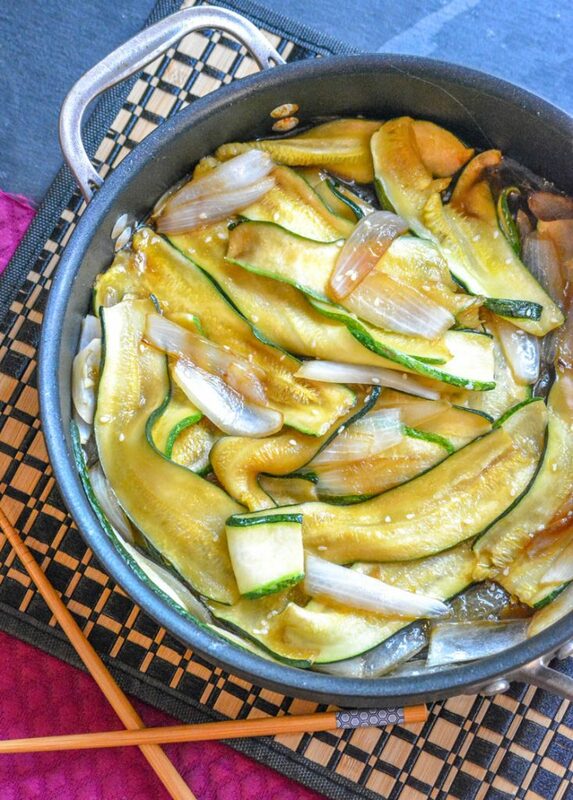 Stir in the zucchini, and cook an additional minute or so. Add the sauces & seeds, stir to evenly combine and coat the veggies. Cook, stirring occasionally, until the zucchini's tender- about another 5 minutes. Season with pepper, to taste, and serve. 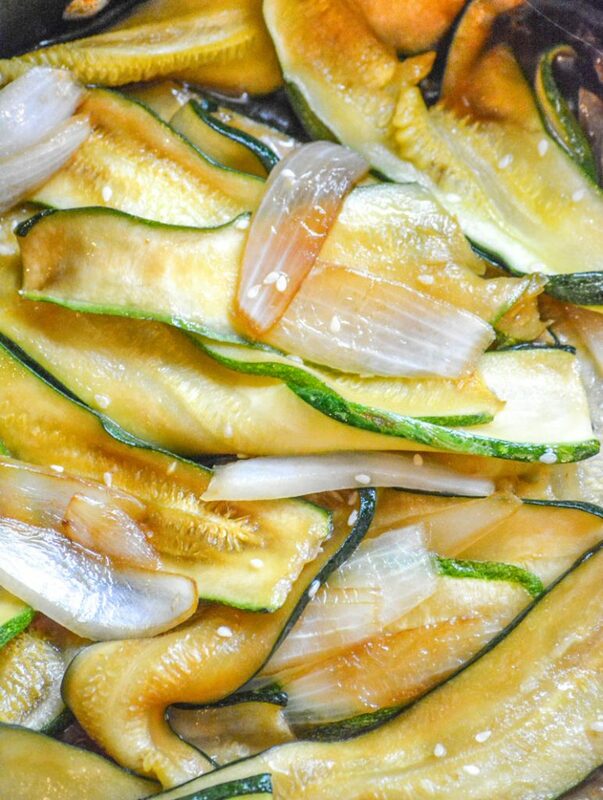 As written the recipe only calls for squash and onions, but if you're like us and love mushrooms- stir in a heaping 1/2 cup when you add the zucchini. Sorry about your squash crop, hope the rest of your veggie patch came through for you! This dish looks wonderfully tasty! Next year! At any rate, thanks for sharing with Fiesta Friday!